In previous posts, we have looked at some of the manuscripts (House and Tenure Books) used to complete the published version of Griffith’s Valuation. In this post, we will attempt to identify the exact location of the family in Fanningstown. 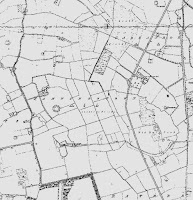 While most of the maps included a number reference to Tenure and House Books on the map itself, not all townlands followed the standard. One of those areas was Fanningstown. I suspect that may have been because of the large number of changes in the population during the survey process. The published version of Griffith’s for Fanningstown is shown to the left.2 Compare that with the House and Tenure Books shown in the last post. (What did the House Look Like) You can see how many changes were made to the numbering scheme in each book; and, sometimes the books do not even match one another. There was an appeal process to challenge valuations. 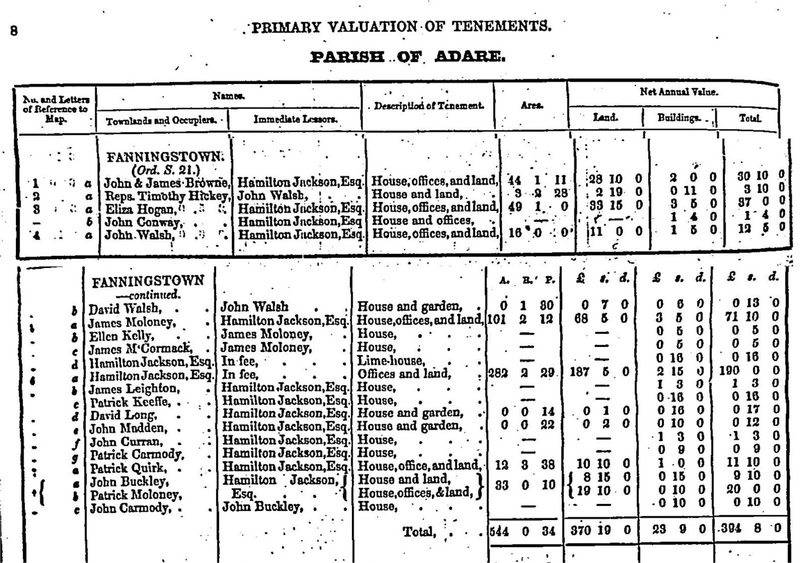 The appeal for Fanningstown was held 3 February 1852 at the Session-House in nearby Croom. Many of the appeals have been published. I have not found one for Fanningstown so it is not known what those specific changes would have been. Even more changes were made by the time the first Revision Book (dated late 1850s to 1862) was retired. 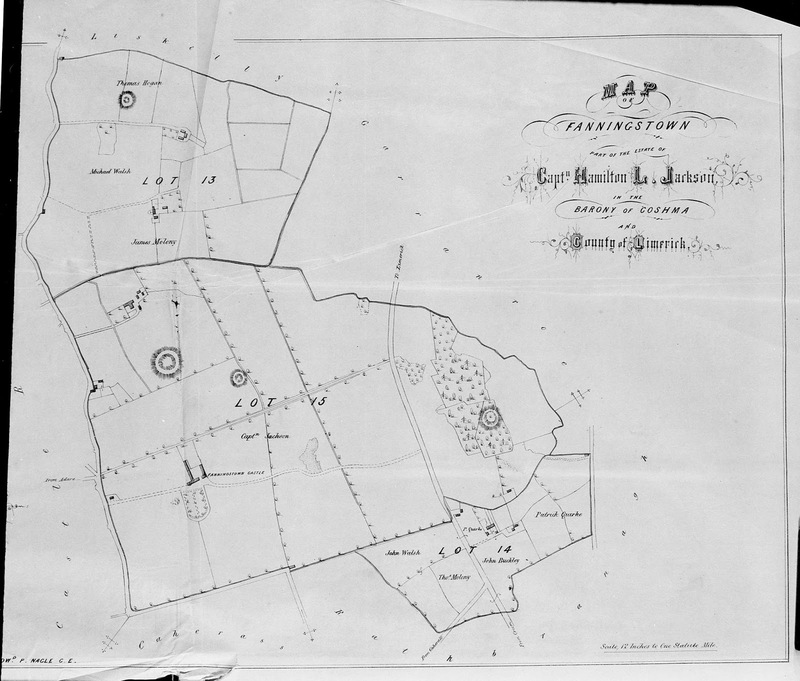 And, to complicate the picture even more, Fanningstown, along with other areas, was sold at a public auction by the owner, Hamilton Jackson, on 10 July 1860.3 A very helpful sales catalogue was created to advertise the sale which included a map and detailed descriptions of the leases and when they were contracted, along with information about the major tenants. 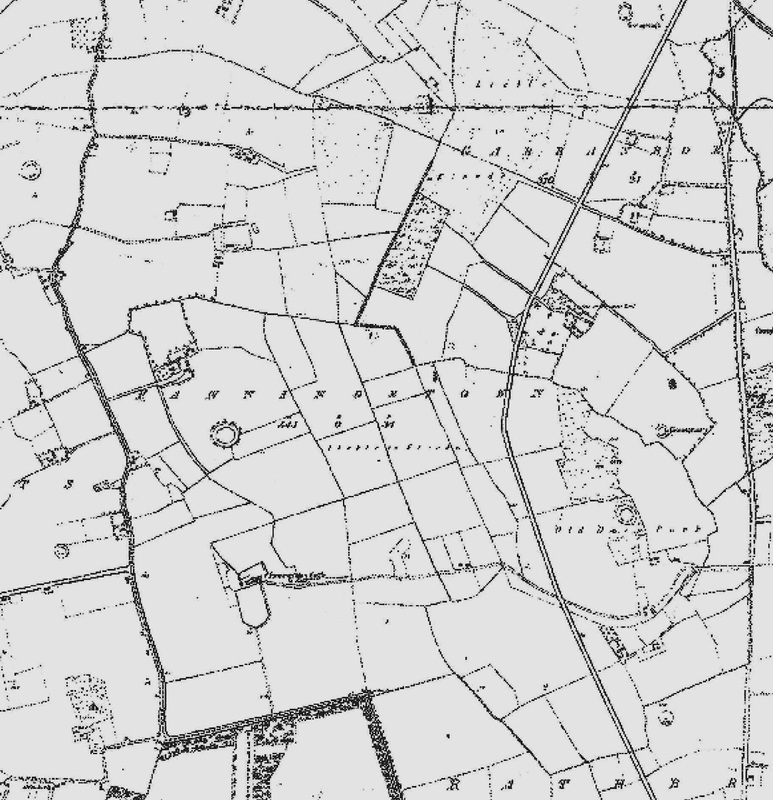 Fanningstown was divided into three Lots. I believe all were sold to the same person, Sir David Roche, who owned a nearby estate. 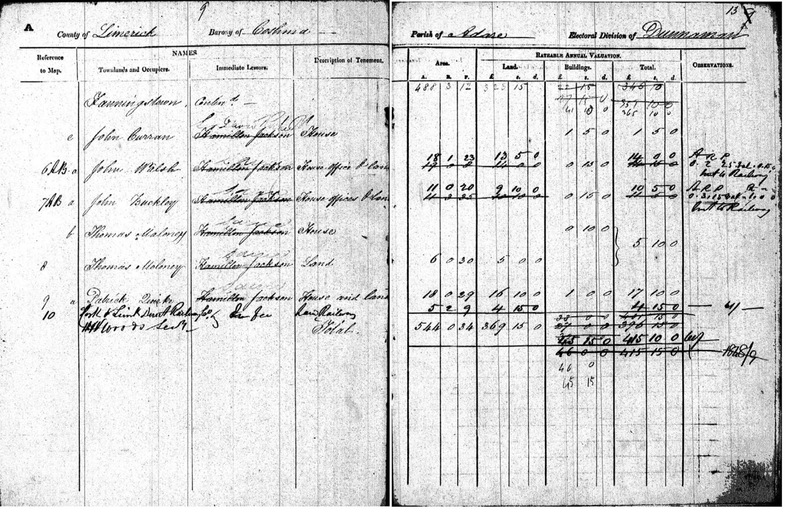 Also shown left and below are detail schedules of the sales catalogue and both pages of the 1862 Revision Book. I will not attempt to identify all of the changes, but, there are a few that may help in locating the property. 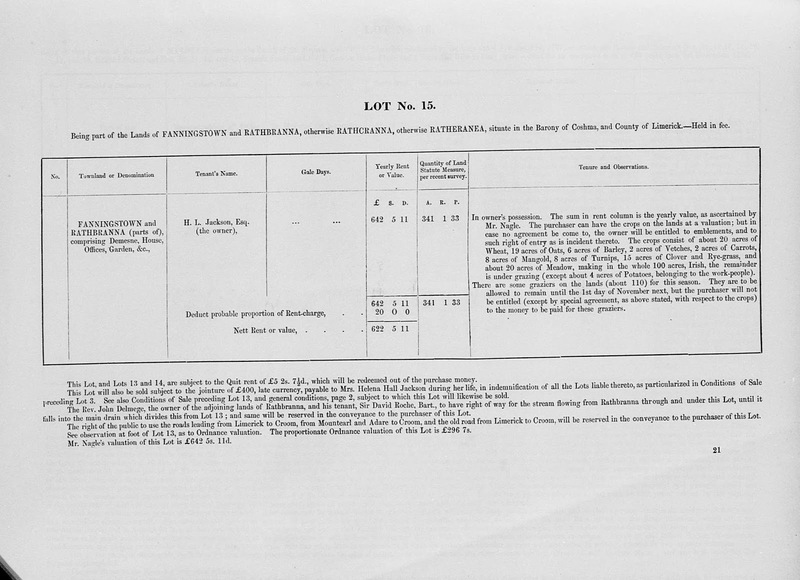 The first thing we notice when comparing the Tenure Book (shown in a previous post), the published Griffith’s, the sales catalogue, and the Revision Book is the large amount of acreage that was redistributed; some to the owner, Mr. Thomas Jackson7, and some to other tenants. The tenement for Thady and Thomas was originally listed as #11a & b in the Tenure Book, but renumbered 7B. It was given up to the owner prior to the publication of Griffith’s. 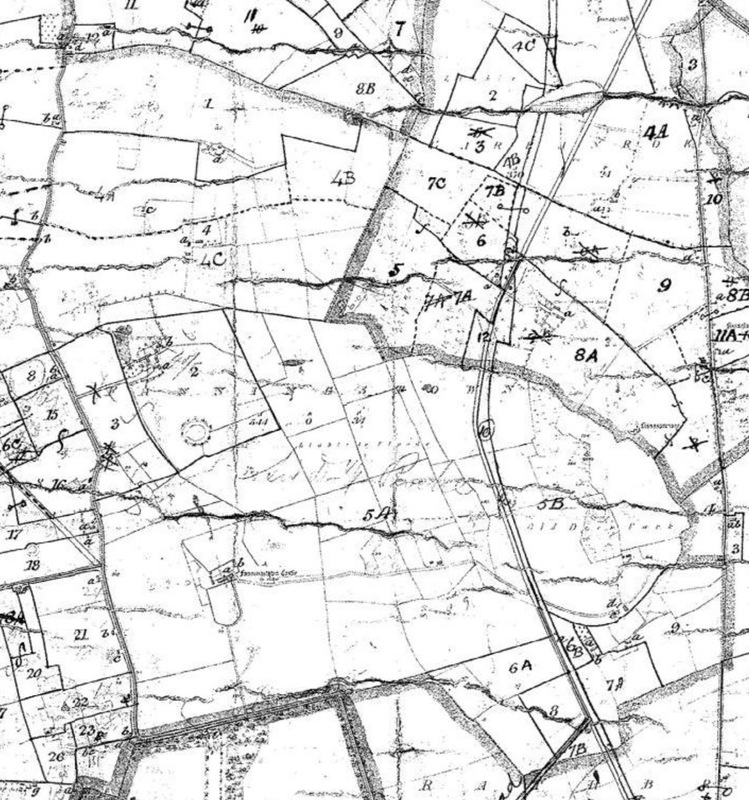 Because this information does not help to put them on the map, we try to find some consistencies in all of the records that will identify, at least, someone in the townland. James Moloney is shown with 54 acres in the Tenure Book; 101 acres in the published Griffith’s (plus 47 acres); and, 61 acres in the Revision book (minus 40 acres). The earlier House Book identified him as having the only slate roof house in the townland. The description in the sales catalogue also identifies this tenement with a slate roof house, the only one in the townland. From this information, we can determine that this is likely the same property. The property is located on the map from the sales catalogue in the lower portion of lot 13, and as 4C in the Revision Book and on the revision map in the same location as the sales catalogue. While the Tenure Book listed the property of John and James Brown as 23 acres, it was shown with 44 acres in the published Griffith’s, an additional 21 acres. If we look closer at the description and map for the sales catalogue, Thomas Hogan is shown with the same acreage. Moreover, the valuation of the house (£2) is the same in both Griffith’s and the Revision Book. 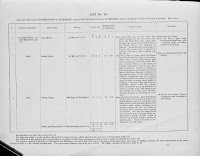 The description for Thomas Hogan states the tenancy began in 1856, a date when John and James could have been gone. It looks like Thomas Hogan took over the holding of John and James Brown. It is shown in the sales catalogue map in the top most section of lot 13 and as lot #1 on the revision map. 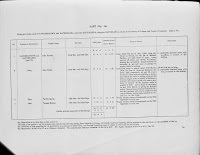 Perhaps part of the Thady and Thomas property was combined with John and James Browne and subsequently included in the tenement of Thomas Hogan? There may also be another explanation. Eliza Hogan, (some relation to Thomas Hogan?) held 36 acres in the Tenure Book. A notation states that 15 acres was given up to “Capt Jackson.” That would have left 21 acres which could have been combined with the John and James Brown holding to make up the 44 acres. To add to the confusion Eliza Hogan is shown with 49 acres in the published version of Griffith’s. She is not shown in the sales catalogue, nor, the Revision Book. Michael Walsh is shown in Lot 13 of the sales catalogue with 37 acres. Michael Walsh is not shown in Griffith’s, but, there is a John Walsh with 16 acres and a David Walsh with only a small garden. (The Tenure Book shows ten acres as the combined acreage of John and David Walsh.) Is Michael related to John and David? The Revision Book shows Michael with 32 acres and 12 acres. The 12 acres is in dispute with James Moloney. 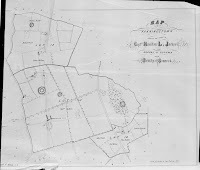 Could the 32 acres be part of the tenement that was given up by Thady and Thomas Browne, or, is it part of the property that belonged to Eliza Hogan? These entries are all very confusing. Even more confusing is that the Tenure Book does not show property owned by the Jacksons. The published Griffith’s shows 282 acres; the Revision Book shows 284 acres; and, the sales catalogue shows 341 acres, lot 15 in its entirety. The Revision Book and map does show tenaments two and three with 31 and 17 acres respectively within the area of lot 15 in the sales catalogue, and, probably accounts for the difference in acreage stated for the owner. Could these two lots be the property of Thady and Thomas?? Lot 14, although there are still many changes, is a little more stable; yet, Thady and Thomas could have held land in that area also. Griffith’s, the sales catalogue, and the Revision Book do show the total acreage for the townland at 544 acres. Regardless of how the property is sliced and diced, the numbers do not point directly to a specific location of Thady and Thomas. I feel fairly certain that John and James were living in the holding identified as Thomas Hogan in the sales catalogue and Revision Book and map. They were always identified in the number one spot in the earlier records. I also think that the holding of Thady and Thomas was in the area identified as lot 13 in the sales catalogue although I can’t be specific as to the location. One final observation is the dashed line running through the section labeled 4A, 4B, and 4C on the revision map. Does this have anything to do with land disputes or earlier land divisions? 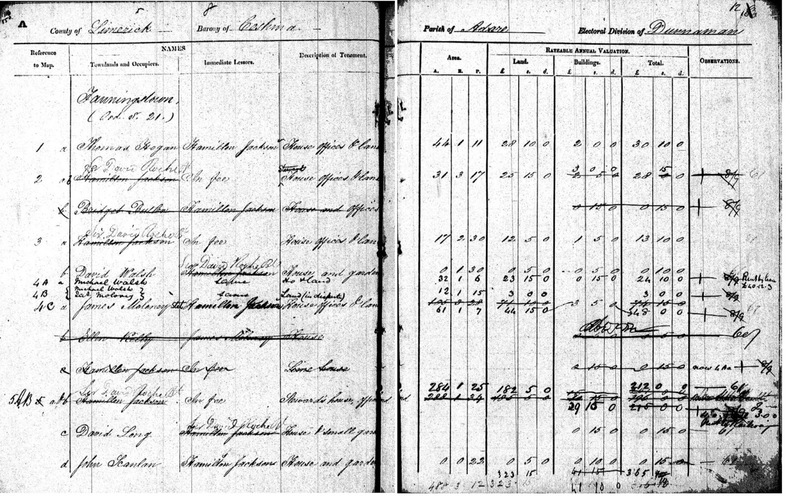 Take a look at the records and see if you can distinguish the property. I’d love to hear your conclusions! 2. Griffith, Richard, General Valuation of Rateable Property in Ireland . 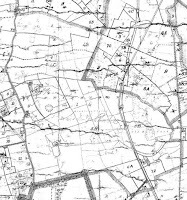 . . Barony of Coshma, County Limerick, Unions of Croom, Kilmallock, and Rathkeale, Parish of Adare,Townland of Fanningstown 1851, Digital image from Find My Past: www.findmypast.com/ The image has been modified to display the entire townland on one page rather than spanning two pages as shown in the original. 7. The Tenure Book shows the owner as Thomas Jackson. The sales catalogue and Revision Book show Hamilton Jackson. Hamilton Jackson is the son of Thomas Jackson. Can we go back another generation?